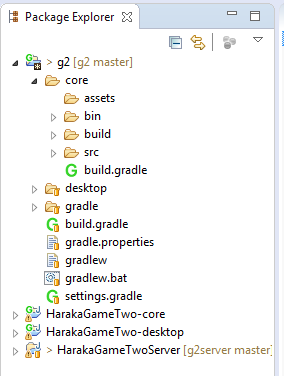 I'm using Eclipse for a Game Project using LibGdx as framework and Grandle (god I hate it). I'm trying to push the repositories to GitHub, but I can't stage the "core" folder in the commit. It's considered unstaged. Any idea how can I stage this folder ? It looks like Eclipse isn't letting you add the core folder. First, it is a good thing that you didn't add that folder, because as you can see it contains folders called bin and build, both of which likely contain binary files. In general, you should not add binary files to Git because it doesn't handle these files well. Now as to why you could not add core, the likely explanation is that not everything contained in this folder is managed by Git. Instead, you should only be staging files which are managed by Git (the src folder?). If this is not it, fallback to the CLI and check git status and git ls-files. Not the answer you're looking for? Browse other questions tagged java eclipse git github repository or ask your own question. Visual Studio 2015 Community: Commit to github via command line produces inaccessible file…?